Saturday the track was open for regional and national practice bringing out some of the biggest names in LOORRS racing. Some stayed for Sunday’s race including Drew Britt who won the Pro2 Class and Jacob Pearsons who finished 3rd in the Open Pro Class. Sheldon Creed took the Kary Environmental Checker Flag in the Open Pro Class, in front of other Saturday drivers Kyle Hart, Marty Hart’s son and Wayland Campbell, Shannon Campbell’s son. In Foddrill’s Limited Buggy class, winner Kevin McCullough, 2nd place Lindsay Geiser, and 3rd place Austin McIntyre had extra motivation to get to the checker flag with a $500 cash bonus split between the winners compliments of Foddrill’s. Mixed in the same heat race was the Foddrill’s 1600 Desert Limited Buggy Class winner Will Wing. 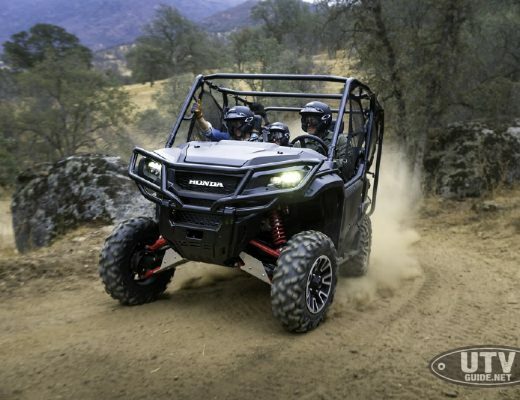 There were two UTV classes at the Arizona Regional race last weekend. Big O Tires Unlimited UTV class was won by Big O sponsored Adam Gruender. 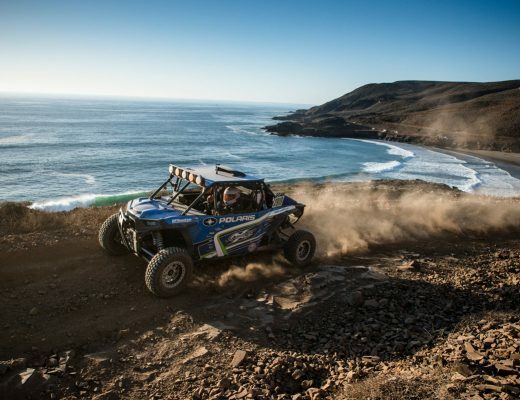 The Weller Racing SR1 UTV race later in the afternoon had a lot of entertainment. Jimmy Fishback, in his bright orange UTV, was out front for the majority of the race giving Optima Battery / Weller Racing Jason Weller and Corry Weller a real race. With only a couple laps left, the passenger rear tire flew off the Fishback car opening the lead to Jason Weller. Corry Weller, Jason’s wife, would take second place after a two lap battle and Clayton Graham would step into third. There are 5 truck classes that run at the regional race. Early in the day the Open V8 trucks and Ultra4x4 class share the track. Gary Zweffel won the Open V8 class, and with only a few lining up for the Ultra4x4 class after the recent King of the Hammers, Jack Adams took the first win of the season. About mid-day the Hellion Mini Stock Trucks take the course. Neil Weaver won the Mini Stock class after the two podium disqualifications due to suspension length. To finish the day, the last class on course is the Select Glass Full Stock Truck class. 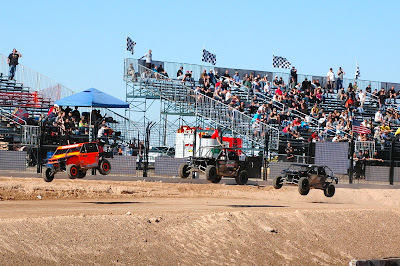 The big trucks launched into the air and at the end of 10 laps Brendan Beeler would take the win with Nick Johnson and Roger Gonzales behind him. The largest category of racing, and the reason that regional races are so important as part of growing our sport, is the Junior Kart Classes. Parker Steele would stay in front of 10 other competitors winning the McMullen Fabrication and Transaxel Jr2 Karts class. In another class of 11 Jr1 Karts, Mason Prater would take the win. In the final Arizona Luxury Lawns & Greens Modified Karts class, Cole Mamer, Gavin Harlien and Jeff Hoffman would battle to the end finishing in their respected order. When looking at the list of 34 racers, Kali Kinsman’s name stands out competing in all three classes with a 6th, 2nd, and 12th place finishes. Parker Steele competed in two classes with a 1st and 5th place finish, along with many other sharing family names. If you haven’t been to a short course regional race, we encourage you to watch this excellent recap of the race by Dirty Media: https://www.youtube.com/watch?v=sha2JEL1Ugs The next race will be April 6th at Speedworld Off-Road Park in Surprise, AZ. To get more information on the past or upcoming events go to www.arizonashortcourse.com. 11. DNF #210 Ray Roben Jr.
Foddrill Limited Buggy – Additional $500 purse on this class for the opening round compliments of Foddrill Motorsports.